You know it’s an ideal recipe for a weeknight meal when you can make both the main and side in the same pan. 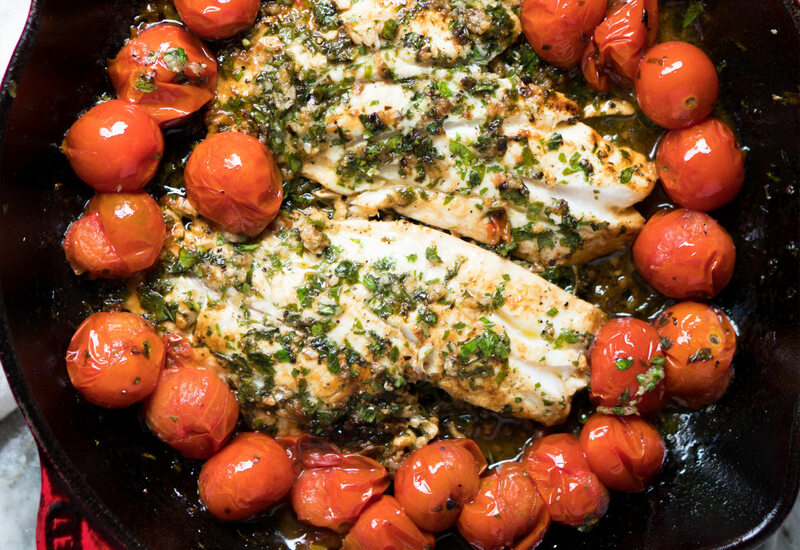 This pan-fried fish with cherry tomatoes can be whipped up in a flash, while still packing quite the flavor punch! Start by making a marinade of garlic, parsley, olive oil, red wine vinegar, and mint. Beautiful cod or halibut fillets only need about 10 minutes in this flavorful marinade before cooking. In just about 30 minutes from start to finish you have an elegant and healthy meal. Serve with lemon wedges for a burst of citrus just before you dig in. This recipe works just as well with chicken breasts. Simply add the tomatoes and the chicken at the same time! Per Serving: 460 calories; 21g fat; 16.2g carbohydrates; 54g protein; 125mg cholesterol; 338mg sodium. This was absolutely delicious! I made a couple updates which worked really well: added chopped and seeded Roma tomatoes and sundried tomatoes. Added butter and cream to the tomatoes after frying the fish and made a nice sauce. Served over parmesan rice.... Yum! I will definitely make this again! Loved this simple, yet flavorful dish. So easy to make! Only note is that my filets were somewhat thick and my cook time was almost double on each side. I used chicken and followed the recipe tip of adding the tomatoes and the chicken at the same time. Such a great idea, it turned out perfect! Used cod and it was really good. I usually don't marinate my fish for fear that it will turn to mush, but 10 minutes in the fridge was perfect. I did speckled trout filets with the tomatoes, and used lemon, parsley, and garlic (no mint). It was really good, so glad I tried it.